These classes are available from 9:30 a.m. to 2:30 p.m. on selected days during Spring Break. Most classes are held for one day only. Environmental Science Merit Badge is a three day class to meet the requirements. Breathe Journey – Girls will work on their Breathe Journey awards and create a take action project to share with others. Bring a sack lunch, Chick-fil-a will not be offered. Family Life – Scouts will learn the roles families play within the community, the importance of family life, how to strengthen their own families. Prerequisites 3, 4, and 5. This is a three-day course to complete the merit badge. Investigate the interactions between air, land, water and life and the human impact on each of them. (Eagle) Bring a sack lunch, Chick-fil-a will not be offered. 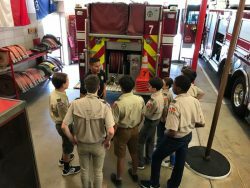 Citizenship in the Community – Scouts will explore how our local governments work within their community and their part within the community. (Prerequisites 3 & 7) (Eagle) Bring a sack lunch, Chick-fil-a will not be offered. Programming and Designing Robots – Girls will create a program that could run a robot and design a robot that solves global problems. If time allows girls will begin Showcasing Robots Badge. Bring a sack lunch, Chick-fil-a will not be offered. Personal Management – Scouts will explore budgets, finance and investment strategies. Prerequisites 2a 8a-d. Bring a sack lunch, Chick-fil-a will not be offered. Programming and Designing Robots – Girls will create a program that could run a robot and design a robot that helps other people. If time allows girls will begin Showcasing Robots Badge. Bring a sack lunch, Chick-fil-a will not be offered. First Responder – (Class fulfills the requirements of the badge and provides participants with Red Cross First Aid Certification) – learn what to do in the case of emergencies of all kinds and how to administer First Aid from American Red Cross certified instructors. Scouts will learn the rights, liberties and responsibilities of being a citizen of the nation. (Eagle) (Prerequisite 2, 3 & 8) Bring a sack lunch, Chick-fil-a will not be an option offered. How do different countries get along? Do events affect a country’s economy, security and health of its citizens? Scouts will discuss international relations, the various political systems and what it means to be a world citizen? (Eagle) Bring a sack lunch, Chick-fil-a will not be an option offered.